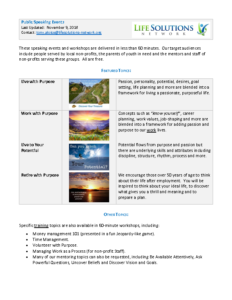 Various speaking events are offered, all focused on living to our purpose, passion and potential. Live with Purpose. Passion, personality, potential, desires, goal setting, life planning and more are blended into a framework for living a passionate, purposeful life. Work with Purpose. Concepts such as “know yourself”, career planning, work values, job-shaping and more are blended into a framework for adding passion and purpose to our work lives. Live to Your Potential. Potential flows from purpose and passion but there are underlying skills and attributes including discipline, structure, rhythm, process and more. Retire with Purpose. We encourage those over 50 years of age to think about their life after employment. You will be inspired to think about your ideal life, to discover what gives you a thrill and meaning and to prepare a plan. See our flyer for a downloadable summary. Contact us to schedule an event.